BRK is, a non-receptor tyrosine kinase, overexpressed in approximately 85% of human invasive ductal breast tumors. It is not clear whether BRK expression correlates with breast cancer subtypes, or the expression has prognostic or diagnostic significance. Herein, we investigated the correlation of BRK with any breast cancer subtypes and clinicopathological significance of BRK expression in breast cancer. 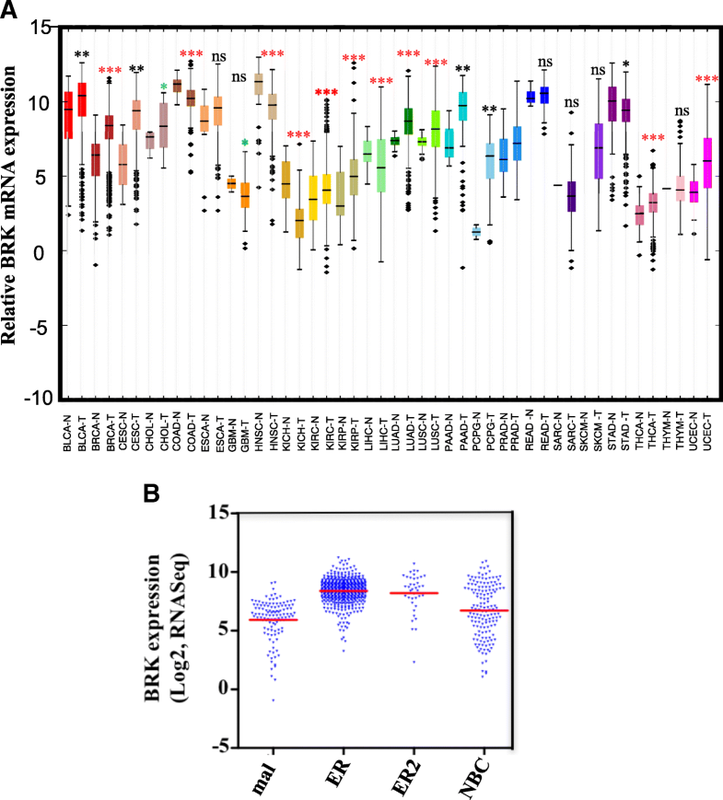 In this study, we examined BRK expression in 120 breast tumor samples and 29 breast cancer cell lines to explore the positive correlation between BRK and the expression of ERα. We used immunohistochemistry, RT-PCR, and immunoblotting to analyse our experimental samples. We demonstrate that estrogen induces BRK gene and protein expression in ER+ breast cancer cells. 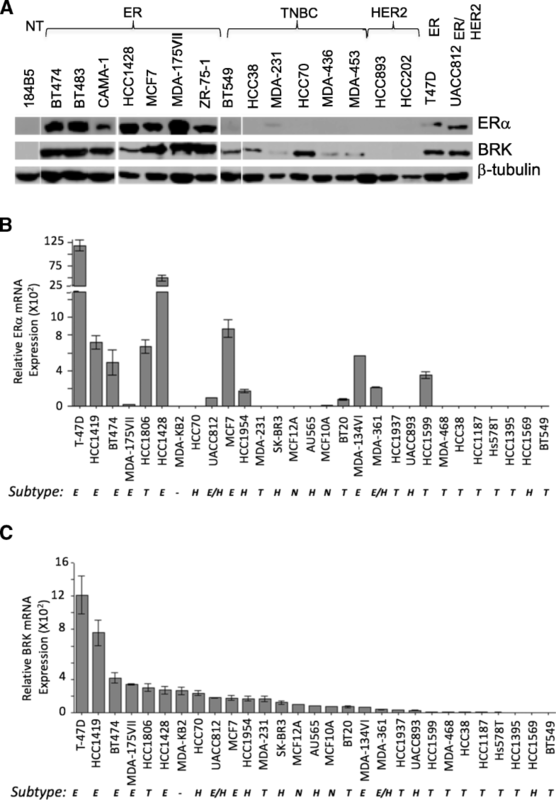 Over-expression of ERα in the ER-negative breast cancer cell line increased BRK expression, and knock-down of ESR1 in MCF7 cells reduced BRK levels. 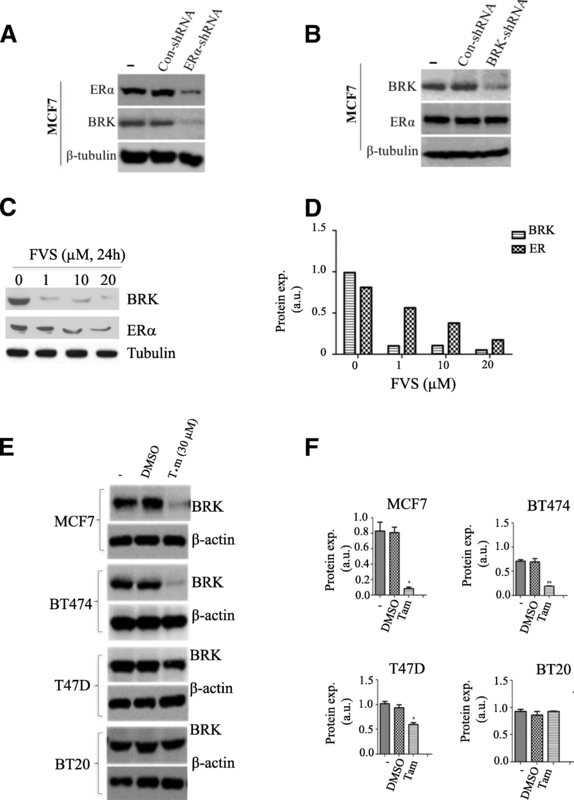 Further, we provide evidence that BRK is regulated by ERα signaling and the presence of ER antagonists (tamoxifen and fulvestrant) reduce the expression of BRK in ER-positive breast cancer cells. Finally, we demonstrate that the overall survival of ER-positive breast cancer patients is poor when their cancers express high levels of BRK. Our data indicate that BRK is a prognostic marker for ER+ breast cancers and provide a strong rationale for targeting BRK to improve patients’ survival. Breast tumors are classified into four major molecular subtypes [1–3]: HER2 (human epidermal growth factor receptor 2) type, Basal cell type, and Luminal A and B types. The HER2 type displays an overexpression of HER2, is usually high-grade and occurs in about 25% of cases . The Basal cell type is mostly characterized as triple-negative breast cancer (TNBC) because of the lack of ER and progesterone receptor (PR) expression and HER2 amplification. This subtype has a high proliferation rate, has a poor prognosis and occurs in about 5–10% of breast cancer patients . The Luminal A and B types are ER-positive and occur in nearly 75% of breast tumors [1–3, 6]. The ER signaling pathway plays a critical role in mammary gland development and is activated by its ligand, estrogen or estradiol (E2) . The ER is, therefore, a prime therapeutic target for luminal breast cancers. The ER is targeted directly by antiestrogen agents such as the partial antagonist tamoxifen (Tam) and pure antagonist fulvestrant , and indirectly by aromatase inhibitors (AIs) that block the production of estrogen . BRK is overexpressed in approximately over 85% of breast carcinomas, but low or undetected in the normal mammary gland . BRK has been implicated in several signaling cascades, especially mitogenic signaling . Recently, we showed that BRK activation significantly enhanced tumor formation in xenograft models . Targeted overexpression of BRK in the mouse mammary gland was shown to enhance survival of the mammary epithelial cells and tumor formation and induce delayed involution [13, 14]. Surprisingly, no investigation has been undertaken to explore whether the overexpression of BRK is linked with any of these major subtypes. Given the high expression of BRK in the majority of breast cancers reported, we set out to investigate whether there was a functional link between BRK expression and the various molecular subtypes of breast cancer. We found a correlation between BRK expression and ER expression in ER-positive breast cancers. We, therefore, explored the functional link between BRK and ERα signaling in ER-positive breast cancer. Additionally, the clinical relevance of BRK expression in tumors of ER-positive breast cancer patients was investigated. All breast cancer cell lines were obtained from the American Type Culture Collection (ATCC, Manassas, Virginia, USA). They included AU565, BT20, BT474, BT549, HCC38, HCC70, HCC1187, HCC1395, HCC1419, HCC1428, HCC1569, HCC1599, HCC1806, HCC1937, HCC1954, Hs578T, MCF7, MDA-MB-134, MDA-MB-175, MDA-MB-231, MDA-MB-361, MDA-MB-468, MDAkb2, SKBR3, T47D, UACC812, and UACC893. MCF10A and MCF12cell lines, derived from normal human breast epithelia were also obtained from ATCC. Both sets of cell lines were obtained as part of the ATCC Breast Cancer Cell Panel (ATCC® 304500 K™) and were cultured according to ATCC recommendations for fewer than six months from the time of resuscitation. The supplier performed authentication. Total RNA was isolated from all the cell lines using TRizol as was recommended by the manufacturer (Invitrogen). The RNA quantity and quality were analyzed using a spectrophotometer and gel electrophoresis, 1.5 μg of total RNA was then used as a template to generate 20 μL, of first strand cDNA using the Thermo-scientific maxima first strand cDNA synthesis Kit as was recommended by the manufacturer (#K1642; Thermo Scientific). The procedure was carried out as we previously described . Immunohistochemistry (IHC) staining on human breast cancer tissue array BR10010a and BR243d with rabbit anti-BRK (C-18) antibody was performed and analyzed by USBIOMAX (https://www.biomax.us/). Briefly, the tissue samples on each array were formalin fixed, paraffin embedded. Tissue array sections were mounted on the positive charged SuperFrost Plus glass slide. Primary antibody rabbit anti-BRK(C-18) antibody (sc-1188) was purchased from Santa Cruz Biotechnology, Inc. ImmPRESS™ Reagent anti-Rabbit Ig (peroxidase) of catalog number MP7401 were purchased from Vector Laboratories. DAB (DAKO Cytomation, Code K3465) used as substrate chromogen. Antigen retrieval solution was purchased from DakoCytomation (Target Retrieval solution, S-1699). The standard procedure can be obtained through https://www.biomax.us/. Proteins derived from either whole cell lysates or derived from immunoprecipitations were resolved via SDS-PAGE in 10% polyacrylamide gels. The resolved proteins were then transferred onto nitrocellulose membranes and immunoblotted with indicated antibodies as previously described . Cells were co-transfected with the BRK promoter (− 964 to + 1; 250 ng/well) along with an effector plasmid that encodes for either the ESR1 or ESR2 full-length protein . Twelve hours after transfection, cells were then treated 17β-estradiol (10 μM) for 24 h and Luciferase activities determined on the TD-20/20 Luminometer (Turner Designs). Using the LightSwitch Assay Reagent (Active Motif, Carlsbad) as recommended by the manufacturer to determine. The GFP-BRK constructs were generated as described before . Plasmids encoding GFP-ERα and GFP-ERβ were a kind gift of Dr. Michael Mancini (Baylor College of Medicine, Houston, Texas 77,030, USA). Plasmids encoding the BRK shRNA and ER shRNA sequences were procured from Santa Cruz Biotechnologies (sc-29,305-SH and sc-108,060, respectively, Santa Cruz, CA USA). All plasmids used were transfected in the indicated cell lines using polyethyleneamine (PEI) (23966–2, Polysciences Inc., PA, USA) as the transfection reagent. Cells were seeded in 10 cm dishes and cultured to approx. 70–80% confluency before transfection. Briefly, 10 μg plasmid DNA was first diluted in 430 μl 0.15 M NaCl via gentle vortexing. Next, 60 μl PEI was added and the mix vortexed briefly. The transfection mix was incubated at room temperature for 10 min to allow the formation of DNA-PEI complexes and was then dispensed drop-wise into the culture dishes. The dishes were then swirled gently to allow even distribution of the DNA-PEI complexes and incubated at 37 °C overnight. After 24–48 h post transfection, where necessary, the transfection efficiency was assessed via visualizing the cells on a fluorescent microscope (1 × 51 Olympus X-cite series, ON, CA) before proceeding with further experiments. For the generation of a stable BRK or ER knockdown cell line, MCF7 cells were transfected as described above with shRNA-carrying plasmids targeting either the BRK or ER message. 24 h post-transfection, cells stably incorporating the shRNA sequences were selected with 2.5 μg/mL puromycin and cultured to confluency. BRK and ER knockdown was then verified via Western blotting using the appropriate antibodies. The established stable cell lines were maintained under a minimal puromycin dose (0.5 μg/mL) . Cultured cells were treated with varying doses of estradiol (E2) (10,006,315, Cayman Chemicals) to determine the optimal working concentration. The cells were seeded in 6-well plates, and cultured in media supplemented with either 20, 10, 1, 0.1, 0.001 μM E2 for 24 h. Dimethylsulfoxide (DMSO) and tamoxifen (4-hydroxytamoxifen) were purchased from Sigma Chemical Co. (USA). Fulvestrant was purchased from Cayman Chemical (USA). Cells were treated at an indicated concentration of the antagonists and cell lysates analyzed by immunoblotting. RNA-seq Version 2 data containing tumor samples of 24 different types of cancer and adjacent non-tumor tissues were downloaded from The Cancer Genome Atlas project (TCGA) website (https://cancergenome.nih.gov/). The TCGA dataset itself is publicly available and contains multi-dimensional maps of the key genomic changes in 33 types of cancer from more than 11,000 patients. We used only the RNA-seq Version 2 dataset for analysis of BRK gene expression. To evaluate the relationship between BRK expression and the patient clinical outcome we used the KM Plotter Online Tool (http://kmplot.com/analysis/) in different breast cancer subtypes . This is a public database contained information from 5143 breast patients that permits to investigate the association of genes with overall survival (OS) and relapse-free survival (RFS). One-way ANOVA followed by a post hoc Newman-Keuls test was used for multiple comparisons using GraphPad Prism version 5.04 for Windows, GraphPad Software, San Diego California USA, https://www.graphpad.com/. Spearman correlations were determined as described by the developer (https://www.wessa.net/rwasp_spearman.wasp/). Significance was set at P < 0.05 and error reported as plus or minus the standard deviation. BRK is overexpressed in breast carcinomas and has also been detected at elevated levels in a few other cancer types [16, 19–21]. We compared the expression pattern of BRK mRNA in 24 different cancer types provided by TCGA (https://cancergenome.nih.gov/). We observed that BRK mRNA expression was higher in most of the cancers compared to the non-cancerous tissues (Fig. 1a). Fifteen of 24 cancer showed expression levels that were significantly higher (P < 0.05) than their respective normal tissues. Six different cancer types displayed lower levels of BRK mRNA compared to normal tissue, whereas three cancer types had too few samples to determine statistical significance (Additional file 1: Table S1). The most significant difference (P = 1.2 × 10− 31) was observed in the breast cancer cohort, comprising of 100 normal mammary tissues and 1084 breast carcinoma tissue samples (Additional file 1: Table S1). Our findings indicate that BRK mRNA is upregulated in most cancers, but the differential expression of BRK is most significant in breast cancer as compared to normal tissues. Next, we cross-examined a breast carcinoma (BRCA) cohort and stratified samples into the three main breast cancer subtypes: HER2+, ER+ and to TNBC, for relative differences in the transcript levels. As it is shown in Fig. 1b, the log2 fold change of the BRK mRNA in different subtypes of breast cancers. 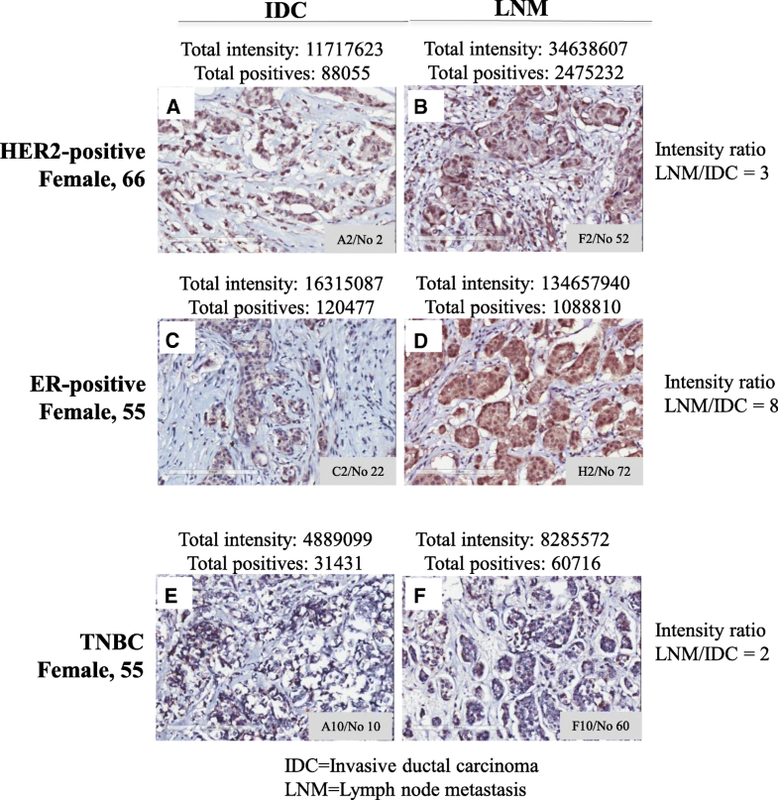 It demonstrated significantly higher expression of mRNA in luminal (ER+) breast cancers (P = 8.1 × 10− 45) compared to HER2-positive or TNBC subtypes, with a P values of 2.3 × 10− 11 and 0.002, respectively (Additional file 1: Table S2). Both the total intensities and a number of positives were higher in the ER-positive samples compared to other subtypes (Additional file 2: Figure S1). These data demonstrate that although BRK mRNA is upregulated in all breast cancer subtypes; this increased expression is more enhanced in ER-positive breast cancers. To determine whether the observed differential expression pattern of BRK mRNA in breast cancer subtypes is corroborated at the protein level, we first examined the expression of BRK in tissue microarrays (TMAs). Two TMAs (US Biomax, MD, USA) were used in the study. 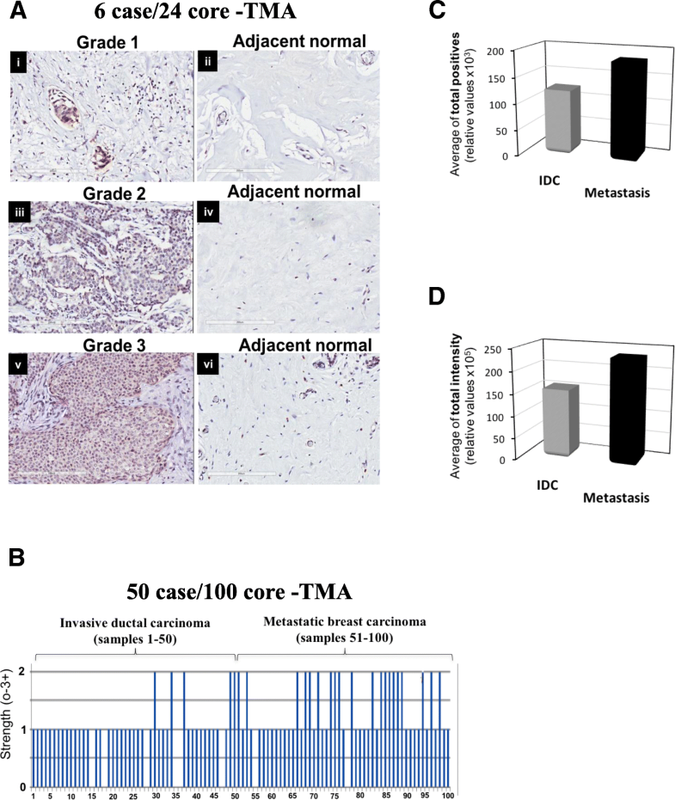 The first TMA is a 6 cases/24 cores array that contains 12 invasive ductal carcinomas (IDC) samples, classified according to tumor grade, and 12 adjacent normal mammary tissues (Additional file 1: Table S3). The second TMA (50 cases/100 cores) contained 50 cases of breast carcinoma and 50 matched lymph node metastasis (LNM) samples (Additional file 1: Table S4). Tissue staining intensities for BRK were scored using a 4-point scale 0–3+, where 0 = no staining, 1 = low staining, 2 = moderate staining, and 3 = strong staining. Analysis of the 6 case/24 core-TMA (Additional file 1: Table S3) revealed that: 1) BRK was overexpressed in the tumors, but low or absent in the adjacent normal tissues in all samples (Fig. 2a); and 2) BRK immunoreactivity increased significantly with tumor grade with the lowest expression in Grade 1 and the highest staining in Grade 3, whereas Grade 2 displayed an intermediate level of expression of BRK (Fig. 2a). Next, we analyzed the differential expression of BRK in IDC and metastatic carcinoma samples in the 50 case/100 core-TMA (Additional file 1: Table S4). We observed BRK immunoreactivity in over 80% of specimens, with staining score of + 1 or + 2 (Fig. 2b). Only 5 out of 50 (10%) IDC samples had + 2 intensity (Fig. 2b). More strikingly, 20 out of 50 (40%) metastatic carcinoma samples displayed a 2+ BRK staining (Fig. 2b). The total number of BRK-positive samples were distinctly higher in the metastatic carcinoma samples compared with the IDC samples (Fig. 2c and d). We next compared the values from the IDC and the lymph metastasis (LNM) in the TMAs. Representative IHC data are shown in Fig. 3. We detected the strongest expression of BRK in samples derived from ER-positive patients, compared with HER2, PR alone or TNBC samples (Fig. 3c and d). It is worth noting that the intensity of BRK expression in ER-positive LNM samples is 16-fold higher than the TNBC value. Further, we noted that for each patient, the expression of BRK (total intensities and a total number of positives) increased as cancer progressed from IDC to LNM (for example, compare Fig. 3c and d values). The LNM to IDC ratio for total intensity was higher in ER-positive patients compared to the ratio in HER2-positive and TNBC patients (Fig. 3): ratio was 8, 3, and 2 respectively for ER-positive (Fig. 3c vs d), HER2-positive (Fig. 3a vs b) and TNBC (Fig. 3e vs f) samples. These results demonstrate that: 1) the expression of BRK protein increases with malignancy even within the same patient, and 2) the expression of the protein is higher in ER-positive samples compared to the other subtypes. Our findings suggest that BRK is a marker for ER-positive breast tumor progression in particular. Our IHC data demonstrate that the expression of BRK varies based on tumor grade and malignancy, as well as molecular class, and higher levels are observed in ER-positive tumors (Fig. 3). Like primary tumors, there is substantial variability amongst breast cancer cell lines based on some criteria including gene expression profile, molecular class, subtype, tumorigenicity and metastasis [22–26] (Additional file 1: Table S5). We examined the expression of BRK in a panel of 18 mammary epithelial cells. This panel included eight ERα-positive cell lines, six TNBC cell lines, and two HER2-positives, and one ER/HER2-positive cell line, as well as an immortalized, non-tumorigenic cell line (184B5) used as a control cell line. BRK protein expression was not detected in the control cell line, 184B5. As it is shown in Fig. 4a, all ERα-positive breast cancer cell lysates analyzed displayed high BRK expression. However, BRK expression level in the TNBC and HER2-positive cell lysate were low or undetected. These data, which suggested a correlation between the protein expression of BRK and ERα, also correlated with transcripts expression (Fig. 4b, c). Statistical analysis (Pearson Correlation) revealed a strong correlation (R = 0.77 and P-value = 0.000001) between BRK and ERα mRNA expression. Together, our data further provide evidence that there is a positive correlation between BRK expression and ERα status in breast cancers. Since we observed that ERα is overexpressing cells and tissue display correspondingly high expression of BRK (Fig. 4), we investigated whether there was a functional link between BRK and ERα. ERs signal via different pathways including the nuclear estrogen response element (ERE)-dependent or -independent pathways . We performed in silico analyses on the 5` UTR of the BRK promoter using MatInspector (http://www.genomatix.de/) and identified three EREs within a 1500 bp region proximal to the transcription start site of the BRK promoter (Fig. 5a), indicating a potential regulation of BRK gene expression via an ERE-dependent pathway. We, therefore, hypothesized that BRK might be a target gene of ER signaling. Thus, we treated the cells with increasing concentrations of E2 for 24 h and observed that E2 treatment resulted in a dose-dependent increase in BRK levels in the MCF7 cells (Fig. 5b). The same observation was made for ER-positive T47D cell line (Additional file 2: Figure S2). E2 treatment of ER-negative BT20 cells did not affect BRK levels (Additional file 2: Figure S2). However, E2 treatment induced the expression of the luciferase reporter in both the ERα- and ERβ-transfected cells (Fig. 5c). Further, ERα or ERβ overexpression in ER-negative cell lines, SKBR3 and BT20, induced upregulation of BRK protein levels. Taken together, our data indicate an E2-ER-mediated regulation of BRK and suggest a functional link between BRK and ER in ER-positive breast cancers. Since E2 stimulation upregulated BRK mRNA and protein levels in ERα-positive breast cancer cell lines (Fig. 5), this implied that BRK was downstream of the ER-signaling pathway. We, therefore, investigated how the loss of ERα expression affects BRK protein expression. We knocked down ERα or the inhibited ER-signaling with ERα antagonists such as tamoxifen and fulvestrant to examine whether it suppresses BRK expression. As it is shown in Fig. 6a, we used ERα-shRNA to efficiently knock down ERα expression by approximately 75% in MCF7 cells, resulting in a dramatic decrease in the expression of BRK, by approximately 80% (Fig. 6). Notably, the reciprocal knockdown of BRK did not affect the expression levels of ERα (Fig. 6b). Further, we next tested if fulvestrant, an ERα down-regulator could modulate BRK expression and observed that fulvestrant treatment resulted in a dose-dependent reduction of BRK expression (Fig. 6c, d), which corresponded with the downregulation of ERα protein as reviewed previously . Similar to fulvestrant, the effect of tamoxifen, a selective inhibitor of ERα function, was tested. We found that tamoxifen treatment resulted in a dose-dependent downregulation of BRK in ERα-positive cell lines MCF7, T47D, and BT474, but not in ER-negative BT20 cells (Fig. 6e, f). DMSO control did not affect BRK expression. Collectively, our data establish endogenous ERα as a positive regulator of BRK expression in breast cancer cells. Furthermore, we conclude that two clinically-relevant ERα antagonists with different mechanisms of action, fulvestrant, and tamoxifen, can be used to inhibit BRK expression. In this study, we found that ERα regulates the expression of BRK in ER-positive breast cancer cell lines and tissues and that E2 signaling regulates BRK expression. Based on our observation, we hypothesized that BRK transcript expression might be associated with the clinical outcome of ER-positive breast cancer patients. Overall survival analysis of breast cancer patients’ samples from the TCGA data set revealed that: 1) ER-positive breast cancer patients have a better prognosis than all the other subtypes combined (n = 1102; P = 6.3e-07; Additional file 2: Figure S3A); 2) high BRK levels in the breast in breast cancer patients tend to be associated with shorter overall survival than patients with low BRK levels (n = 1102; P = 0.65; Additional file 2: Figure S3B); 3) high BRK levels in ER-positive tumors is associated with shorter overall survival, (n = 491; P = 0.84; Additional file 2: Figure S3C). We also identified an association between BRK expression and relapse-free survival (RFS) in ER-positive tumors as a whole (hazard ratio, HR = 1.14, P = 0.38) (Additional file 2: Figure S3D), and in ER-positive subtypes luminal A (HR = 1.2, P = 0.37) (Additional file 2: Figure S3E), and luminal B (HR = 1.14, P = 0.13) (Additional file 2: Figure S3F) tumors. Although our data, in general, did not reach statistical significance, it can be deduced that high BRK expression was significantly associated with poor RFS in tamoxifen-treatment patients (n = 161; P = 0.0043; Additional file 2: Figure S3G), thus strengthening the rationale for ER/BRK co-targeting in ER-positive breast cancers. Breast cancer is stratified into four main subtypes: the ER/PR+ luminal A and B subtypes, the HER2-positive subtype, and the TNBC, which is characterized by the absence ER and PR expression as well as the lack of HER2 overexpression or gene amplification. The luminal types comprise the most common group and occur in nearly 75% of breast tumors [1–3, 6]. In our study, we also found that BRK expression (mRNA and protein) correlates more with ER+ breast cancer tissue and cell lines. However, various studies in the past have correlated BRK expression with different breast cancer subtypes. Born et al. found a significant correlation between BRK and HER2 at the protein level . Co-overexpression of BRK with HER3 and HER4 has also been reported . Both studies suggested that BRK plays a functional role in the HER-signaling cascade. However, Irie et al. found a strong correlation between BRK expression and luminal B (ER+ and HER2+) breast cancers patients, but not with basal-like tumors . We found that BRK is regulated by E2 signaling, supporting a functional link between BRK and ERα in ER-positive breast cancers. This mechanism of regulation in other subtypes is different. The expression of BRK is regulated by mitogenic signaling in HER2-positive breast cancers . The E2–ER–ERE pathway plays a crucial role in regulating the oncogenic effect of the ER. We identified ERE sites in the BRK promoter and demonstrated that E2 stimulation resulted in increased levels of both BRK transcript and protein in ERα-positive breast cancer cells. Consequently, ERα-positive breast cancer cells treated with either tamoxifen or fulvestrant resulted in a dose-dependent decrease in BRK expression. However, ERα did not co-immunoprecipitate with the BRK promoter (data not shown). It could be reasoned that the BRK promoter region harbors critical cis-acting elements including those for transcription factors such as Sp1, AP1, and NF-kB , suggesting BRK gene expression via E2-signaling may be ERE-independent. The prognostic significance of BRK in human malignancies is uncertain. Aubele et al. used a cohort of invasive breast cancer cases and demonstrated that the high BRK expression predicts low disease-free survival . Publicly available gene expression microarrays data showed that ER-positive patients with high expression of BRK might be at increased risk of relapse (Additional file 2: Figure S3). We found that breast cancer patients with high levels of BRK mRNA, as well as ER-positive patients, tend to have worse overall survival probabilities, irrespective of the ER-positive subtypes. Irie et al. however used a different cohort and reported that the expression of BRK in Luminal B tumors, in particular, was associated with poor outcomes . Additionally, our data also showed that in tamoxifen-treated patients high BRK is associated with poor RFS, which suggest that co-targeting ERα and BRK in ER-positive breast cancers are clinically relevant. In summary, our data show that BRK is overexpressed in most of the ERα-positive breast cancer cells and tissues. Additionally, we also found that ER regulates BRK expression in ER-positive cells and tissues by E2 signaling. Furthermore, we have observed that elevated BRK expression is unfavorable for the overall survival in ER-positive breast cancer patients. Therefore, based on the evidence presented we are proposing BRK as a potential ERα-associated co-biomarker that could be a combination therapeutic target for the treatment of ER+ breast cancer patients. Work in this article was supported over the years by funds to KEL from various organizations including the Canadian Breast Cancer Foundation (CBCF) and Canadian Institutes of Health Research (CIHR). KEL and DA were jointly funded by and the Saskatchewan Cancer Agency (SCA). The funding agencies did not interfere with the design, the collection of data and the interpretation of data of the study. All supporting data is available through the corresponding author. SM, KEL: Conceptualization, experiments, data acquisition, writing reviewing and editing, visualization, and project administration. ETB: data acquisition and in silico analysis. RG, CD and YO: data acquisition, analysis and assisted SM in experiments. AW: provided cell lysates. FSV, FJV: Software, data curation. DA: provided cell lysates, review, and editing. KEL: provided supervision. All the authors reviewed and approved the manuscript.